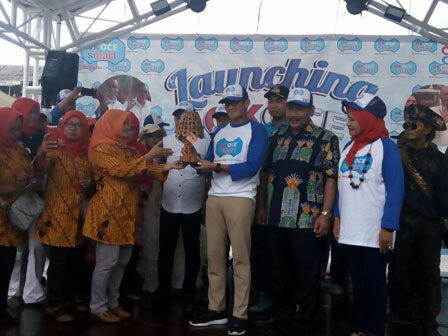 Jakarta Deputy Governor, Sandiaga Uno, attended the launching of OK OCE Smart at Kota Intan Coaching Location (lokbin), Pinangsia, West Jakarta, Sunday (12/31).
" This is part of our economy, which is an independent small business"
In his speech, he appreciated the formation of the OK OCE Smart forum at the Kota Intan Coaching Location. According to him, Jakarta Provincial Government had evaluated it where it has grown for 2.5 months at the location. "This is part of our economy, which is an independent small business," he stated. In 2018, the city would create more than 4,000 business opportunities and quality jobs for the citizens. "I see this getting more concrete. I hope the city's policy can provide opportunities instead of turning off the business," he expressed. The OK OCE Smart launching was marked by Tumpeng cutting by Sandi and continued with dialogue with traders.